6 VBLA-BGCE Extra life after 1st 5,000 pts. 7 CBLA-ARLE Extra life after 1st 10,000 pts. 8 EBLA-A6WE Extra life after 1st 20,000 pts. 9 GBLA-BL4E Extra life after 1st 30,000 pts. 10 JBLA-B3CE Extra life after 1st 40,000 pts. gameplay and graphics, with the same feel as the 'toon. Bloomin' excellent classic game for sega megadrive! very funny and reminds me alot of the tv series which was hilarious! A Great game, reminded my about the TV show alot! a must try! 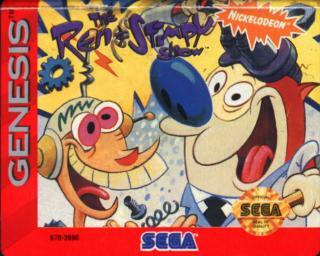 Its crazy, fun, zanny, haliours, great sound, and it has great story line... its REN AND STIMPY!! Too bad this didn't have more elements from the show. It seems they had half on the Genesis and half on the SNES. 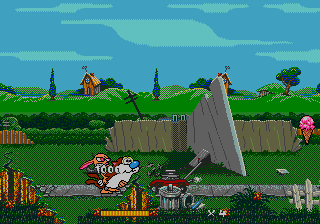 We never got the "Rens a mouse" level! I got this for 5 bucks. Was it a ripoff? I played this game with a mate. I was Ren, he was Stimpy. 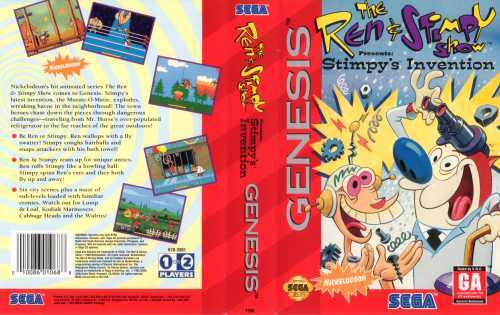 He would accidentally make Stimpy fall down a hole, and I would make Ren go up to him, slap him around the face and shout "You stupid idiot!". Then we would role around laughing for a few minutes. This game is a complete riot when played with a friend. A near essential purchase for the Megadrive! Brilliant! This game is hilarious, specially when you play with a friend. I personally love the hairballs used as a weapon. 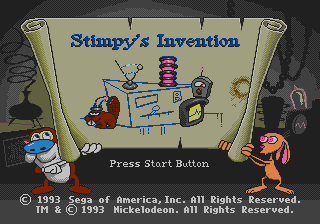 It's Ren & Stimpy. What more do you need? If you fall down a hole, Powdered.....Toast.....Man comes to save your life. I love this game, and the way you can switch characters and use the other one is truly original!